This couple is still happily sharing costar billing after 35 years. My husband’s favorite gift from me, the one he still speaks of with awe, was an hour in an isolation tank in lower Manhattan. Afterward, he marveled at the jangly streets of the city like someone who had undergone a religious experience, senses enhanced, a man reborn. Isolation tanks were a thing in the early ’80s, popularized by the 1980 film Altered States, in which William Hurt immures himself in a soundproof, lightless tank, floating in body-temperature saltwater to research levels of consciousness. My husband tried to articulate what it felt like to go deep, to regain the lost silence of the womb, to still the clamorous mind. I can only reaffirm that he is my complete opposite, and that my experience of being enclosed in a dank, body-sized space would have ended with bloody scratches on the capsule cover and terrified screams as I begged to be let out. Newly married at the time, I experienced a brief pang hearing my husband’s rhapsodies about the tank, fearing that his introduction to my raucous world, including my boisterous Italian family, had driven my new spouse to find relief in a simulated coffin. 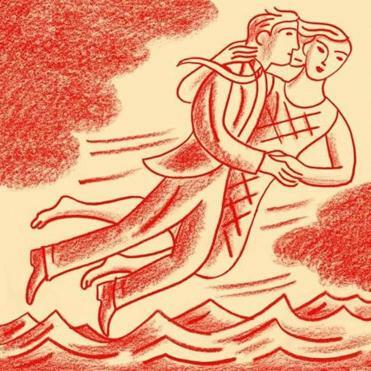 The decision to marry, after living together in a sixth-floor walk-up in Hell’s Kitchen for three years, came during a fraught night of mutual reassurances about independence and keeping the wedding simple and nonintrusive to our Bohemian lives. We were careless about the whole event, snarky, treating it without reverence, making the whole thing spur of the moment. We lied to our families about imminent acting commitments and the need to leave town. We debated where to have the ceremony. I wasn’t romantic or religious, but I balked at holding the wedding at the grim downtown office where we had gotten our marriage license. The clerk bellowing “Cooper! Next!” before we said our vows felt too much like the unemployment line, so we found a Unitarian church. In the anteroom, we posed ironically, mimicking a 19th-century couple, my husband standing with his hand on my shoulder, I sitting demurely, wearing a crown of flowers, smirking at the joke. My ring was from a pawnshop on Canal Street, my antique muslin lawn dress a thrift shop find. Five close friends attended, all of us feeling absurd, as if we were impersonating adults. I don’t remember our wedding poem; it was a second choice because my ex-boyfriend had used the one I wanted — Shakespeare’s Sonnet 116 — just a month before for his own nuptials. I giggled during the ceremony: the minister had abruptly switched voices when she began the ritual, intoning the words in the majestic tones of a hammy actor from an old-timey play. My new husband, though, had tears in his eyes; for him, the solemnity of the moment resonated. Despite his misty-eyed turn during our wedding ceremony, 35 years later, my slyly funny partner can still make me laugh like a 5-year-old. He can adjust his features subtly from across the room and create a commedia mask that undoes me every time. The fact that no one else knows this antic side of him makes it all the more precious. That’s his best gift to me, the laughter, besides being an unconditionally devoted father to our son, for as long as we had him. The ups and downs of the acting profession, the absences it demanded, the rewards it bestowed, the cataclysmic blow of losing our only child — those events and others deepened and changed our perspectives and left us permanently in an altered state. Marianne Leone is the author of “Ma Speaks Up” and “Jesse.” Send comments to connections@globe.com.